Julia was on holiday today, a fact which she celebrated by waking up at 5am just like it was a working day. After a brief lie in she carried on the holiday frivolities with an outbreak of cleaning before making breakfast. The woman just doesn’t know how to relax. She could profit, in this respect, from watching how I do it. When breakfast appeared I decided to join her. It wasn’t quite as simple as that. It never is. First I tied my feet together whilst stepping into my pants, then I noticed I’d put my vest on back to front. Two items of clothing, two problems. Even toddlers do better than that. The process of putting my trousers on, which has often been attended by a certain amount of peril went without trouble this morning so at least something went right. After that I did the laundry and the shopping. Reference to other blog posts that list my Sunday activities will reveal that Julia isn’t the only one who hasn’t quite got the hang of holidays. I also managed to write up most of our visit to Cleethorpes as I need to catch up on my writing about pier visits. That just leaves Skegness. I say that, but as you may have guessed, the holiday is likely to encompass a few pier visits and I’m likely to end the week with more of a backlog than I started with. The trouble with my ambition to elevate procrastination to an art form is that there will always be a list of jobs to do. I may write a haiku about procrastination, as it seems a suitably zen subject. This entry was posted in Uncategorized and tagged getting dressed, holidays, piers, procrastination, relaxation on September 9, 2018 by quercuscommunity. Again, with this being a Kindle book I’ve taken the book cover art from the Amazon website, so thank you Amazon. It’s a good book, though one with quite a few rough edges. You can tell this before you pick the book up because the less enthusiastic reviews, and even some of the more favourable ones, refer to grammar, blokiness, bad language and beer. I’m not that bothered about grammar, as you can probably tell from reading the blog, and, in truth, I didn’t notice any bad language. That probably results from me being desensitised by having two sons and a background of working on farms and markets. Like so many of my contemporaries that year at Finishing School eluded me. It’s a tale of two immature mates and their driver, Midge. The narrative is based on them travelling round 55 piers in two weeks. It is, unsurprisingly, a badly organised and under-funded trip. It’s a familiar model and it felt like I’d read books by this pair before. After looking at their previous books I discovered that I hadn’t. I’ve merely read other gimmicky travel books by similarly immature, badly organised blokes. This isn’t a criticism, just an observation. It was interesting to spend time learning about different lives and their relationships with the seaside, each other, their laundry and their past. There’s even a bit about piers in places, though not a lot. One of the things they discuss early on is a quote from someone – J G Ballard, I think – that travel books never mention the parking. I take this badly, as my post on Cromer, our first attempted pier visit, does feature parking quite heavily. Now it’s going to look like I’m copying them. Apart from that, I have a sneaking feeling that they planned the book better than it looks on the surface. They meet people, they stay in various places (a B&B, camp sites, floors of friends) and they space out the reminiscences. It could be an accident, but it could, under all the casual chaos, be quite a well-planned book. It can be a bit tedious reading about people drinking (even more tedious than actually having to listen to them whilst they are drunk) and about their constant bad planning, but they are likeable idiots and the time passes quite easily as you read. It cost me £3.99 on Kindle, which is more than I normally pay for a Kindle book, but I was happy with it. However, it’s a book about mates on a road trip: if you want to learn about piers buy a different book. I’ll review that later. 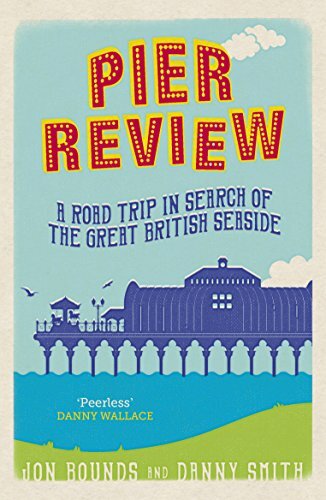 This entry was posted in Book Review, Seaside Piers and tagged bad language, gimmicks, kindle, mates, parking, piers, road trip, travel books on July 31, 2018 by quercuscommunity. A thought struck me this morning. Our kids, though “young” in our eyes, are actually older than Julia and I were when we first met. I’m having trouble putting that in perspective. It makes me feel old, but it also makes me wonder if I’m treating them like children when they are really adults. On the other hand, maybe I’ll start treating them like adults when they start acting like adults. Until then I will keep providing logistical support and offering advice which is ignored. That represents most of the thinking I did this morning because, after dropping Julia off at work, I went back to sleep for much of the morning. I was able to set the bedroom fan just how I like it and go back to sleep for four hours. The new router finally arrived from British Telecom. It only took three months, five phone calls and (from them) multiple examples of poor customer service for us to get this far. At this point I think it’s fair to point out that this is far, far better than my experience with Virgin. I’m still both impressed and appalled by the way I made tea last night. Julia didn’t know what she wanted, just “something light”, so I threw together avocados, prawns, rocket, coleslaw, tomatoes and thousand island dressing (or ketchup, mayonnaise and plain yoghurt if you require accuracy). It’s impressive because I merely toured a supermarket pulling things from shelves and produced a reasonable meal. Even after forty years of cooking for self and family I’m still always amazed when I manage to do that. On the other hand there are ecological issues with avocados and prawns, plastic issues with bagged rocket, tomatoes and coleslaw and some air mile and additive concerns too. I should have done better at growing my own (we’ve grown virtually nothing this year) and I’m capable of making better coleslaw than the one we had last night. I just looked up eco-guilt as I think that’s what I’m suffering from. It is a word, though without the hyphen. I like the hyphen but I suppose I’ll have to lose it. Also known as “green guilt”. There’s a whole post waiting to be written on that. Meanwhile I’m a bad parent and mediocre husband – do I really have enough guilt left to encompass the plight of avocado farmers and plastic-eating sea creatures? Unfortunately not. I would like to worry about them, but it’s not going to happen until I can find more space in my (metaphorical) self-flagellation schedule. I’ll try to cut down on plastic, and I’ll try to eat less processed food, but it’s hard to remember when you’re busy and shallow. Currently I’m reading a book about three friends touring the piers of England and Wales. It’s research, as I’m considering doing the same thing. I’ve always wanted to write a book so I may stitch together the blog posts on piers and give it a go. One fear is always about word count – can I write enough words. I reckon the blog now runs to around 400,000 words which suggests that stamina and vocabulary won’t be a problem, though it’s still only enough words to do 80% of War and Peace. I once read Gone with the Wind (400,000 words) when I was about 16. It took a weekend. I then moved on to War and Peace (500,000 words), lost my way in the family names, stalled, tried again and lost the will to live. That is a lot of words, though I feel War and Peace was probably easier to write than it is to read. I’ve just counted the words I’ve written on two piers and two lots of fish and chips – 2,739. If I extend to crabs, winkles and candyfloss that should give me 75,000 words, which should be enough for a book. Add in the words I’ve done on marshes, butterflies and such and we come up to around 100,000 words, probably a few more if we get held up in traffic. This is likely to be too many. It looks like I’ve just publicly committed myself to visiting over 50 piers and writing a book about it. Having done that, and I did think about it before I wrote it down, I now have no excuses. This entry was posted in writing and tagged Avocado, eco guilt, parenthood, piers, salad, travel books, word count, writing a book on July 15, 2018 by quercuscommunity. Full Speed Ahead, and Damn the Cholesterol! The first life-threatening dietary experience of the holiday was fish and chips in Sheringham. We started the day with bran flakes in the hotel room and, after a long, hot walk round Strumpshaw Fen decided it was time to head off in search of a pier. I think it’s time to reveal that we have set ourselves the target of visiting every pleasure pier on mainland Britain. This may expand to encompass Ireland, the Isle of Man and the Isle of Wight, but then again, it may not. There are about 65 of them and based on the events of this week I may run out of cash and stamina before I see them all. We tried Cromer pier, but couldn’t find anywhere to park. They seem to have obtained a large supply of No Entry signs since last time we visited, about 15 years ago. What with the one way system and the road works we tried three different ways to get round and failed each time. Eventually, after a seven point turn in a narrow street, I broke the cycle and parked behind the church, only to find out that all the space was reserved for disabled drivers and taxis. One of the reasons I hadn’t noticed this before parking was that the painted signs were faded. The other was that there were no disabled drivers or taxis using the spaces. This was to become a familiar pattern of the holiday. That effectively broke my spirit and I decided to call it a day and head for Sheringham. You can park in Sheringham, next to the station with a preserved steam railway and a Victorian Penfold letter box (originally in use 1866-79). They seem rather more welcoming in Sheringham. We eventually ended up in the Sheringham Trawler, a bright and cheery fish and chip restaurant. I was going to link to an information site – visitsheringham.co.uk – but they have a notice on the page telling me not to link to them without permission. While I can understand them having a problem with me stealing content I’m not sure why it’s a problem for me to link to them. They are, after all, a site that you would think would want exposure for Sheringham. The establishment was, as I said, bright and cheery. They have pictures of local scenes on the walls and a programme of local events in the menu. The staff were great and the menu was good, though as long as they have haddock and chips with mushy peas all menus are good for me. When the meal arrived it lived up to our hopes, being very tasty, generous in the portion department ans accompanied by a good-sized lemon wedge and a plastic container of tartare sauce. I suppose we shouldn’t be using so much plastic but that and the fact that they don’t tell you where the fish comes from, were the only two negative points that I can think of. The batter was light and crisp too, which I forgot to mention earlier. Another nice touch was the use of beef dripping for frying. It’s supposed to be healthier than more fashionable fats and why just upset vegetarians when you can also offend pescatarians and Hindus too. I have a low opinion of pescatarians, so this is a plus point. This entry was posted in Uncategorized and tagged beef dripping, chip shop, Cromer, fish and chips, parking, Penfold pillar box, piers, Sheringham, steam railway on July 6, 2018 by quercuscommunity. Sun, Sea and Sand. And Sunburn. I’m sitting here with several hundred photographs and experiencing that warm glow well known to bald men who forget their sun hats in the middle of a heatwave. It’s quite sore at the moment, though it’s nothing like it has been for the last few days. I never knew that my scalp flexed so much until it became painful to move. In just a few hours I returned to a simpler time, to an era when sun wasn’t linked to skin cancer, and I was a carefree youth. I spent a week walking around Norfolk in 1976 and lost the skin off my back and shoulders. Since then I have been more careful – until I hit my second childhood this week. Anyone who is familiar with Swan Vestas will be able to imagine what I look like. (If you aren’t familiar, they are matches with pale stems and bright red heads). We just had a few days in East Anglia. I’ve been taking more exercise than usual and getting more sleep so despite having plenty of material to write about I’ve not done much. Sorry about. When I eventually change the name of the blog I’m considering The Lazy Blogger as a title. It’s not only an accurate title but it’s pretty close to what Julia calls me all the time. I’m just getting back into my stride – it was the sort of holiday you need a holiday to recover from. Seven piers, two forts and a nature reserve don’t see themselves. I also had to consume two lots of haddock and chips and a cream tea for the purposes of research. Lesser men would have wilted under the pressure. I merely whined a little. All will be revealed in due course. For now I offer a selection of photographs of Julia in holiday mood. This entry was posted in Uncategorized and tagged chips, East Anglia, holiday, Norfolk, piers, seaside, sunburn on July 5, 2018 by quercuscommunity.